If, at any time, you feel you need to leave this website quickly, click the "escape site" button. You'll be immediately sent to an urelated website (Yahoo.com). Your Internet, online, and email activities can be easily traced. If you are in danger or feel that reading this website might be dangerous for you, click here to learn how to protect yourself while online. A wall of teal green vests and colorful badges stands firm in the center of the room. 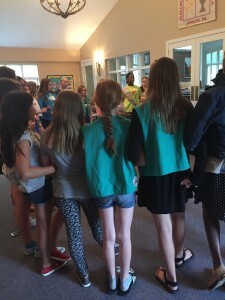 It is formed by a group of girl scouts who are linked arm and arm. Moments ago, these girls were complete strangers. Within minutes they have become a unified bunch, discovering that in some way they are ALL connected. The group consists of six different troops; ranging from ages 10-12. The crowd varies in ethnicity, culture, and economic status. “I like painting”, says one girl. “I connect”, announces another. The girls unite demonstrating how a common interest joins them together. This continues until every girl is linked to the circle. Standing in the center is our speaker for the evening, Lark Irwin. She is from a local organization, A Woman’s Place. A Woman’s Place is dedicated to helping victims of domestic violence. This event is part of their prevention program titled, “Free Being Me”. The goal is to empower young women to step up as leaders in their schools and communities; teach them about healthy relationships, self-esteem, and communication. It emphasizes the importance of accepting our own individuality and embracing who we are. Lark opens the discussion with a focus on a positive girl culture. The group comments on how real friends offer support. They delve into the destructive behavior behind gossip, talking behind each other’s back, and passing judgment. The dialogue continues as the group reveals an encouraging assessment of what makes us unique and how to accept who we are. The most profound question of the night came from Lark, when she asked, not “What” but “Who” do you want to be? Having been quick to answer every question until now, I got the sense that the girls needed a little more time to think this one through. Then one by one they offered a response. As I listened to the answers, I took a moment to ponder the question myself. I considered what makes me who I am and what I strive to become. The answer is simple…I want to be me. Please take a moment to fill out the letter for yourself and discover just how amazing you really are. ← Shoe Heels, Don’t Bother Me!